Let's look at the individual winners first and then the teams tomorrow. Overall Individual. It was expected to be a barn burner of a race but as it turned out, it was Greg Mitchell who burned the barn. Mitchell flew in from McMinnville, Oregon and took home the overall Master's victory by over a half minute and nearly broke the 15 minute barrier, finishing in 15:03. Second through 5th proved to be as tight as expected; those four runners were only separated by ten seconds. Chad Newton of Pisgah Forest, NC and the Atlanta Track Club, nailed down second in 15:40, followed closely by Scott Weeks of Groton, NY [15:43], Craig Greenslit of Berthoud, Colorado [15:44], and Kristian Blaich of Decatur, Georgia and the Atlanta TC [15:50]. Individual Age Group. M40. As usual this went the way of the overall competition as only Blaich was from the next higher age group. M45. As one might suspect, Kristian Blaich ran away with this one, winning the group by nearly a half minute. Then Matthew Whitis (from Tucker, GA and the Atlanta TC) won a hard-fought battle for 2nd by only 4 seconds. Whitis apparently had just a little more left in the tank for the end of the race than did Brian Crowley (Hillsborough NJ and Garmin Runners ). M50. Last year Kevin Miller from Kansas made the trek east and won this age group by over a half minute. This year it was Mark Zamek (Lavellette, NJ) who canme in from a neighboring state to take the top spot in 16:27. Home state runner, Alan Evans, of the Genesee Valley Harriers took a close race for second in 16:44, beating Reuben Henderson (Playmakers Elite/New Balance) by a mere 4 seconds in a very competitive sector of the race. group, at age 68, he broke Dale Campbell's single age record for the course by 35 seconds. This was also significant in that the single age course records up through age 58 are now all under 17 minutes. If Youngers shows up next year and continues to run under 17:00 then all of the individual ages up through 60 will be sub-17. That would bring a big smile to race director, Dave Oja's countenance. M60. This age group had the most outstanding performance, a record-breaking time that was also the top age-graded score. The fleet Irish expatriate from the hills of East Tenessee, Tom McCormack, won the group and smashed 17 minutes in the process. 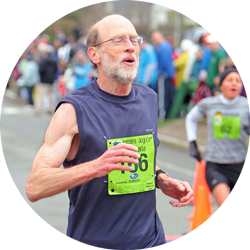 With a time of 16:58, the hero of Jonesborough, TN, running for the Atlanta TC, broke Jim O'Neill's American record of 17 minutes, established 28 years earlier in Carlsbad, CA. Many speedy runners, in the interim, have made the pilgrimage to Carlsbad and to Syracuse, hoping to beat the record, and it has finally been accomplished. The careful reader will note that in passing from O'Neill to McCormack, the record still sits with the sons of Ireland. And it extends the sub-17 age group record up another notch. It is now true that every Masters age group record from M40 through M60 is sub-17. It is now up to others to extend the record. Youngers and Pilcher will be 60 in two years time and will join McCormack in this age group. The 2016 edition should be a race for the ages! The first four runners in this group all came in under 19:00 (and 7 under 20) so there was plenty of speed apart from McCormack. Joseph Reda, II, from DeForest, Wisconsin and Reno Stirrat of Rockaway, NJ had quite a battle with Reda in front by 14 seconds at the tape in a time of 18:19. M65. Lloyd Hansen, the former Ford Exec who fought off heart disease with his running, took the age group prize by over a half minute. Running for his Ann Arbor Track Club, although currently training out of Salt Lake City, UT, Hansen won the group in 18:46, an excellent time. Ann Arbor took the top two spots, as their long time affiliate from the Buckeye state next door, Terry McCluskey [Vienna, OH. ], clocked a very credible 19:22. Gary Patton, the track specialist from Rock Rapids, IA was not far behind in 19:38. This group was not quite as competitive as last year because of injuries.Roger Price and Jerry Learned ran, though injured, but were not able to match their sub-20 minute times of 2013. They should both be back in form by next year and battling for a spot on the podium. year. Frisby did not go away empty handed from this race though. In addition to taking second-place, he, like Youngers and McCormack, took down the single age course record. And, in this case, took the course record time for 70 year olds by a full minute, lowering it to 20:22. Milton Schumacher of North Scituate, RI, took 3rd with a fine time of 21:05. Jan Frisby, in one of his sub-19 minute performances a few years back. M75. John Elliott of Columbia, MD continued to defy the years, winning with a time of 23:32. In the process, he beat the 76 year old's course record by more than half a minute. James Leitz of Bayonne, NJ took 2nd in 24:45, and Wade Stockman of Rennselaer, NY finished off his stint in the M75 group with a third place finish. With any luck he'll be competing for a 2nd or even a 1st place medal next year. M80. John Harper, Jr. of Seal Beach, CA made it all the way across the country and went home with the first place medal in 26:38. A few minutes later, Jon Desenberg from Ann Arbor, MI, came across second min 29:59 [sub-30-yahoo! ], with local favorite, Wally Hayes, from Manlius, NY close behind in third in 30:39. In so doing, Hayes smashed the course record for 82-year old's by more than a minute and a half. M85. Willis Moses, Mister Reliable at age 88, came back again to win his specialty in 34:17. If Moses can come back again next year, he will surely establish a new course record for 89 year old's because there is none currently listed. Another achievement to look forward to in 2015. That wraps up this first recap. Next post will be men's teams and then by the weekend, women's individual races and women's teams. Remember to register for the November 8th USATF 5K Cross Country Championships to be held in Carmel, IN (a suburb of Indianapolis). I hope to see you there.